The discovery of an expansive system of historic clam gardens along the Pacific Northwest coast is contributing to a growing body of work that’s busting long-held beliefs about First Nations as heedless hunter-gatherers. A team of researchers at Simon Fraser University has revealed that First Nations from Alaska to Washington state were marine farmers using sophisticated cultivation techniques to intensify clam production. This week in Native history: On May 8, 1973, members of the American Indian Movement surrendered to federal authorities on South Dakota’s Pine Ridge Reservation, ending their legendary 71-day occupation of Wounded Knee. Set in the same impoverished village as the 1890 massacre, the siege began February 27 and is hailed as one of AIM’s greatest successes. About 200 Sioux Indians participated in the occupation, which attracted supporters from dozens of other tribes and called global attention to generations of mistreatment from federal and local agencies. Hundreds of people marched in memory of Canada’s missing and murdered indigenous women (MMIW) in downtown Winnipeg on a day most moms spent with their families. 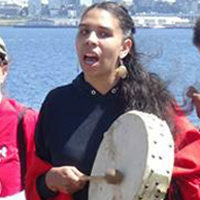 The 11th annual Sisters in Spirit Mother’s Day walk started at the St. Regis Hotel Sunday afternoon, the site where 16-year-old Sunshine Wood disappeared in February of 2004. STANFORD, Calif. – Mothers are being honored this weekend at the 44th Annual Stanford Powwow on the campus of Stanford University. The popular powwow draws thousands of visitors each May as American Indian dancers and drummers from various parts of Indian Country come to celebrate American Indian culture. In the summer of 1998, Mag Cywink, her husband Tom, and a medicine man from Pine Ridge, South Dakota, travelled to southern Ontario. The purpose of their trip was to release two spirits: the spirit of Mag’s sister Sonya and the spirit of Sonya’s unborn child. Days after the Foss Maritime announced that they intended to defy Seattle Mayor Ed Murray, and illegally host Shell’s Arctic drilling fleet, Seattle activists have blockaded Shell’s Seattle fuel transfer station by erecting a tripod. 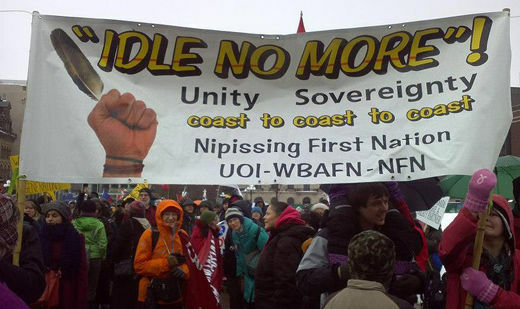 Photo: In this 2013 photo, members of the Nipissing First Nation from southern Ontario and local non-Aboriginal supporters in Ottawa march behind the Idle No More banner (Moxy – Own work Michelle Caron).